The Putin Interviews are culled from more than a dozen interviews with Putin over a two-year span. Never before has the Russian leader spoken in such depth or at such length with a Western interviewer. No topics are off limits in the interviews, which first occurred during Stone's trips to meet with NSA whistleblower Edward Snowden in Moscow and most recently after the election of President Donald Trump. Prodded by Stone, Putin discusses relations between the United States and Russia, allegations of interference in the US election, and Russia's involvement with conflicts in Syria, Ukraine, and elsewhere across the globe. Putin speaks about his rise to power and details his relationships with Presidents Clinton, George W. Bush, Obama, and Trump. The exchanges are personal, provocative, and at times surreal. At one point, Stone asks, 'Why did Russia hack the election? '; at another, Stone introduces him to Stanley Kubrick's 1964 Cold War satire Dr. Strangelove, which the two watch together. 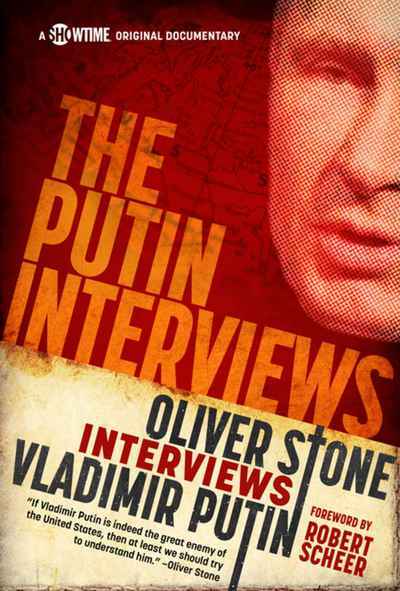 Stone has interviewed controversial world leaders before, including Hugo Chavez, Fidel Castro, and Benjamin Netanyahu. But The Putin Interviews, in its unmediated access to one of the most enigmatic and powerful men in the world, can only be compared to the series of conversations between David Frost and Richard Nixon we now refer to as 'The Nixon Interviews' of 1977. The book will also contain references and sources that give readers a deeper understanding of the topics covered in the interviews and make for a more robust reading experience.